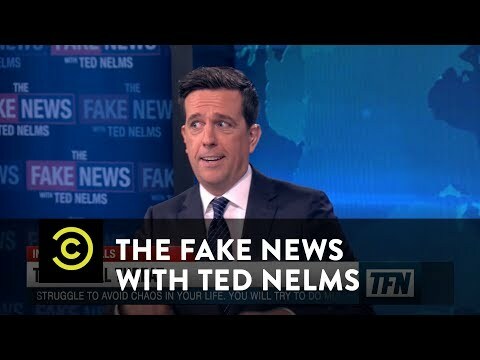 Emmy Award-winning LA-based post production company Therapy Studios handled the spectrum of post work for Comedy Central’s new one-hour special, The Fake News with Ted Nelms, starring Ed Helms (The Office, The Hangover series). Edited by Therapy’s Kristin McCasey and directed by “The Director Brothers” aka Ryan McNeely and Josh Martin of Humble, the special takes a whimsically satirical view of cable news, poking fun at the ridiculous state of current news “reporting.” “Obviously, there are a lot of news organizations out there just making up a bunch of crap and calling it news. But unlike those others, we’re doing it better, faker, and stupider. And we’re joking,” Helms says of the special. McCasey worked on the edit closely with Helms and executive producers Mike Falbo and Nelson Walters to craft the comedic tone of the special. Overseen by Executive Producer Joe DiSanto and Producer Margaret Ward, Therapy Studios perfectly matched the tone of Helms and his team by mimicking and lampooning cable news. In addition to editing by McCasey and Jake Shaver, the color grading of Omar Inguanzo, VFX work by Flame Artist Geoff Stephenson and his team, graphics by Tony Banik, audio mixing by Larry Winer and Brandon Kim, and sound design by Eddie Kim, all helped bring the special to life. Motion graphics were completed by Therapy pals, Visual Creatures. The special is Helms’ return to Comedy Central after his career-making stint as a correspondent on The Daily Show, and sees him once again collaborating with head writer and co-Executive Producer Elliot Kalan (The Daily show with John Stewart).